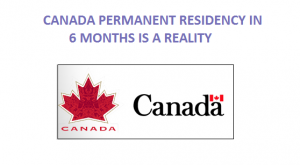 Very recently one of our applicants Mr. Desai got his Canada PR via Express Entry in just 6 months! We got his EOI submitted in the Express Entry pool in March 2016, and he got Invitation the same month. We submit ted his PR application in April 2016, and he got his Passport request in September 2016. Now, this might sound so easy and such a simple case, but that’s not true. Desai had good IELTS score, i.e., CLB 9 because of which his CRS was high, but there was a complication in his work experience. His initial experience was into web designing hence 1 year of experience under NOC 2175- Web designers and developers. Later he moved as a Technical consultant and has 2 years of experience under NOC 2171 Information systems analysts and consultants. Now the issue was with CRS points, under Skills Transferability for 3 years of experience with CLB 9 the points would be 50 & for 2 years with CLB 9 is 25. Now the challenge was to count his initial 1-year experience or not as it is not relevant to the Primary NOC 2171. We went ahead and added the initial not- relevant 1 year of experience under NOC 2175 in the EOI and the CRS points were 50, and his total CRS was 471, this fetched him ITA in the Express Entry Draw. The most crucial point here is – One decision of adding his initial 1-year experience to the EOI changed the future of the application and got the client a visa. The next point to be noted here is- What factors facilitated the application to be processed in 6 months. The primary reason is every document was procured by the applicant as per the format and checklist shared by us. A detailed explanation of his profile was given in the Explanation letter. On a final note, it is very clear that attention to detail, complete and proper analysis of the applicant’s profile, proper coordination between client and consultant lead to SUCCESS. I want PR.social worker and involved in NGO/INGOs.train as personal adminstration.